Next season is looking great. We have a bright future. Against Jesuit last season I had 503 total yards with 7 touchdowns. Peyton Manning because of his playing style and leadership. I started playing when I was 6 years old on the Nicholson Playground. I am being recruited as a QB. 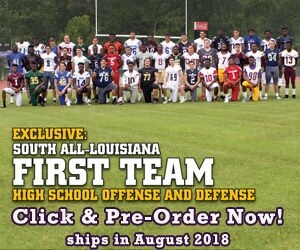 LSU, Ole Miss, Alabama, Aurburn, Mississippi State, UCLA, Cal, Florida State, and Florida.